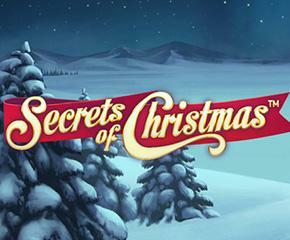 Secrets Of Christmas slots is an entertaining game launched by Net Entertainment. It is a Christmas-themed slot game that gives the players a chance to enjoy this festive season. This slot game also offers a lucrative Free Spins feature. Thus, the players can have fun in discovering the gifts brought up by Santa and can earn some big rewards. Discover the Secrets Of Christmas! Secrets Of Christmas slots feature 5 reels, 3 rows and have 25 fixed paylines. This slot game has been set within the wooden lodge with reels that are surrounded by festive holly and settling snow. The coin range is adjustable from £0.01 to £0.50. Also, the minimum and maximum bets that can be placed are £0.25 and £125.00 respectively. 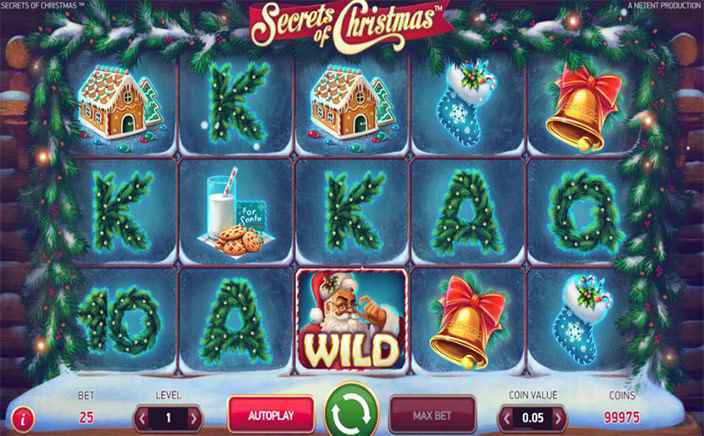 Secrets Of Christmas slots include a wide range of theme-related symbols and these are a candle, a golden bell, cookies and milk, a Christmas stocking and a gingerbread house. The highest rewarding symbol is the golden bell that provides the players 1,250 times of their line stake for five on the payline. Whereas, lower value ones are A, K, Q, J and 10. Santa is recognised as the wild symbol of this slot game and occurs on all the five reels. It can substitute all the symbols except the scatter symbol. Sack of toys is the scatter symbol of this slot. Free spins will get activated by landing 3 or more scatter symbols anywhere on the screen and the players will get 10 free spins. Before free spins begin, the players have to pick up from the twenty Christmas presents so as to win extra bonuses. The number of picks that the players will receive is based on how many scatter symbols the players got to activate this feature. For instance, five picks will be granted for five scatters. Free Spins- two, three, four, five or ten additional free spins.Multipliers- 1x or 2x multipliers will be applied to total win.Wild Reels- Wild covers the reels two and/or four for each free spin.Additional Wilds- candle and/or golden bell becomes wild during this feature. Secrets Of Christmas slots has a decent gameplay and is liked by the slot players throughout the world. It has bright and colourful graphics with appealing sound effects. The return to player percentage is approximately 96.70%.